SKI-ROW AIR Rowing Machine and Ski-Erg Combo – The new SKI-ROW AIR and SKI-ROW AIR + PWR by ENERGYFIT combine the cardio training benefits of both an indoor rowing machine and Ski-Ergometer. With its dual-function capability, the SKI-ROW AIR makes it possible to enjoy rowing and ski training within a single manageable footprint, which is perfect for fire houses, apartment gyms and home gyms. Incorporate HIIT training with the rower and quickly change over to the Ski-Erg in seconds by activating the foot lever. The SKI-ROW AIR goes far beyond just rowing and skiing. Use it for all types of resistance training exercises including lunges, butterflies, tricep extensions, wood choppers and many more. What are the consumer benefits of purchasing the SKI-ROW AIR? Resistance options - the SKI-ROW Air model offers air flywheel resistance with an adjustable baffle plate like top-of-the-line rowers. The SKI-ROW Air + PWR model offers air flywheel resistance without baffle and a magnetic brake with 20 additional levels of resistance. That can turn many of the movements into strength work in addition to cardio training. Flexibility - we didn't invent the SKI-ROW AIR for rowing or skiing purists. This is a total body exercise machine. Rowing and skiing are great, but there’s so much more that our machine can be used for. When raised it essentially becomes a dual high-pulley with air and/or magnetic resistance. In fact we have and will continue to produce alternative exercise videos that can be performed on the machine. Noise - chain drive machines are loud, the SKI-ROW AIR uses dynacord nylon rope which is smooth and quiet. Space - the SKI-ROW AIR combines the functionality and benefits of two machines into just one small footprint. It is perfect for first responders, multi-unit housing, schools and garage gyms. Cost of ownership of one machine is typically lower than two. 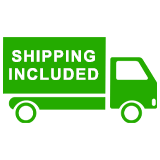 Shipping included within the lower 48-states. UPS Ground – 1-2 units ships via UPS ground. Signature is usually required unless otherwise specified. LTL Freight – More than 2 units shipping to one location ships via LTL freight carrier on a wooden pallet. All standard freight deliveries include 24-hour notification and curbside delivery. Additional services such as lift gate or inside delivery are available upon request. A full inspection is required at delivery and notation on delivery bill of any missing or damaged product is mandatory for replacement. Shipping Dims: Box 1 = 42.3" x 22.6" x 26.8" x 143 lbs. | Box 2 = 72.3" x 22.3" x 7.1" x 55 lbs.